Artist Bio | Pat Thomas, CMI, FAMI Board Certified Medical Illustrator - Chicago, Milwaukee and Madison WI. It seems increasingly common in these days of instant long distance communications, that my clients know me only as a voice on the phone and by the artwork in their hands. I’d like to share with you a little more information to bridge the distance gap. My small business, Pat Thomas Medical Illustration, was established in 1973. Details of my business career can be seen in my résumé. I have been privileged to be the sole illustrator on nine texts and a contributing illustrator for several others. For the past 20 years my primary work has been producing medical legal exhibits. I have worked both defense and plaintiff cases including many high profile trials resulting in multi-million dollar awards. My office is centrally located in the Midwest with most of my clients in Chicago, Milwaukee and Madison, WI. I’ve earned and maintained the designation of Certified Medical Illustrator (CMI). The software company Corel, features me as one of their “Painter™ Masters.” I also have served as an adjunct clinical assistant professor in Biomedical Visualization at the University of Illinois Chicago. In 2006-2007 I was privileged to serve as President of the Association of Medical Illustrators. I have previously served as the Association’s secretary, chaired numerous committees and have received the distinction of Fellow for my contributions. I currently serve on the Board of Trustees for the Vesalius Trust, an organization that provides educational funding for visual communications in the health sciences. “Pat Thomas is truly exceptional to work with, and is an invaluable and accomplished resource for any litigator who needs to teach the medicine of a case, or convey the nature of injuries and medical procedures to jurors. 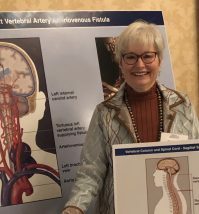 Her wealth of medical knowledge and her years of experience working with attorneys and their experts developing demonstratives for litigation provides her clients with custom medical exhibits that are outstanding.